Let the summer of swim begin! My boys have always loved the water since they were little. 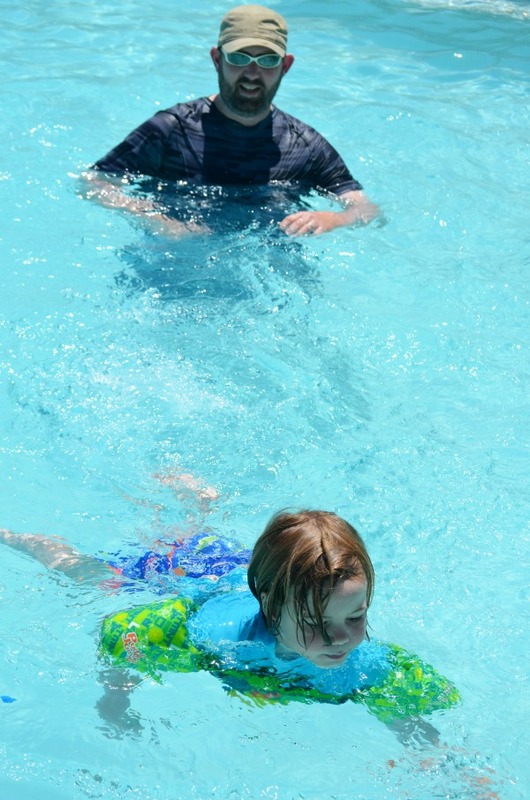 In swim classes they didn’t mind being dunked or having water splashed in their face. Summer also is a time to be reminded of safety when around water. When my oldest was young we tried lots of different flotation devices. None of them worked for us until we found Stearns® Puddle Jumper® life jacket. It’s a US Coast Guard-approved life jacket with a learn to swim design. 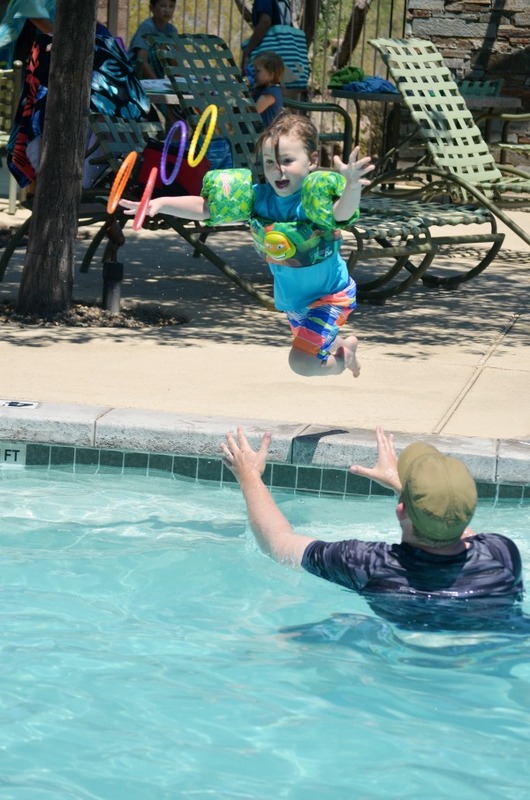 In one summer my oldest went from hanging on my hip to using the Puddle Jumper® life jacket to swimming across the pool. Now my youngest wears his with confidence, eager to learn to swim and keep up with brother. The design keeps swimmer’s, 30-50 pounds, head above water while giving them the range of motion and in the position to work on swimming skills. The design allows more freedom to swim and play without a life jacket riding up around their neck. After a day of swimming it’s time to hop out, rinse off, and dry off. To keep your Puddle Jumper® life jacket lasting throughout the swimming season rinse off with fresh water to get rid of the salt or chlorine. While you’re rinsing down the kids rinse off the life jacket too. Then, it’s time to dry off. While the Puddle Jumper® does have antimicrobial properties it’s still important to hang dry it, just like you’ll towel off the kiddos. 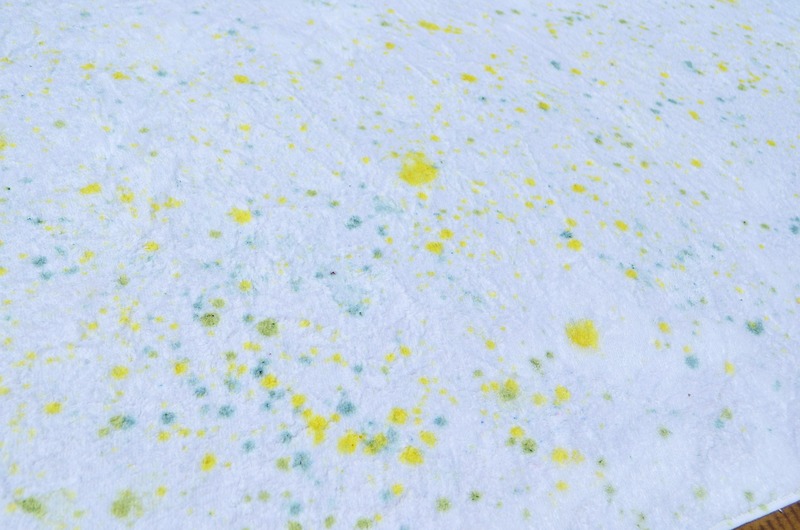 For this summer of fun by the pool we created our own splatter beach towels. My kids will be swimming more safely and drying off in style. This was my first time using fabric dye and it was a series of trial and error. I tried fabric dye and food coloring, along with waiting a day to rinse and dry, but the color still faded. My suggestion would be to go straight for tie dye colors. But still the kids had fun making them and couldn’t wait to dry off with their creations. 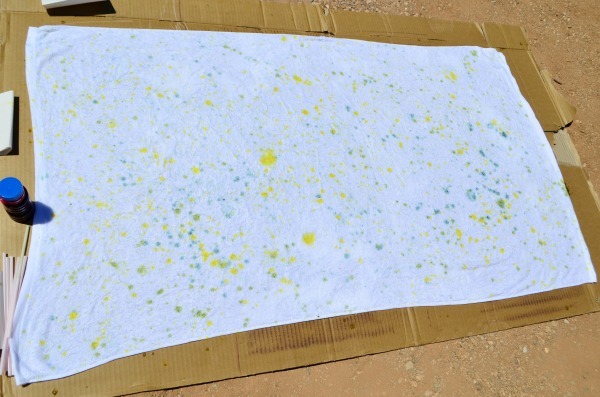 The original plan was to blow bubbles onto the towel and create a bubble burst design like our favorite bubble paint creations. Without a place to hang up the towels and blow the bubbles at it, we opted for a splatter technique using fabric dye and straws. First lay out a protective surface and paint in an area of grass or dirt to avoid staining your patio. Cardboard or a tarp works great as a creative surface. Simply dip the straw into the dye, then blow or flick the end of the straw at the towel. Continue splattering dye until you’ve built up a design that looks like splattered paint on a canvas. 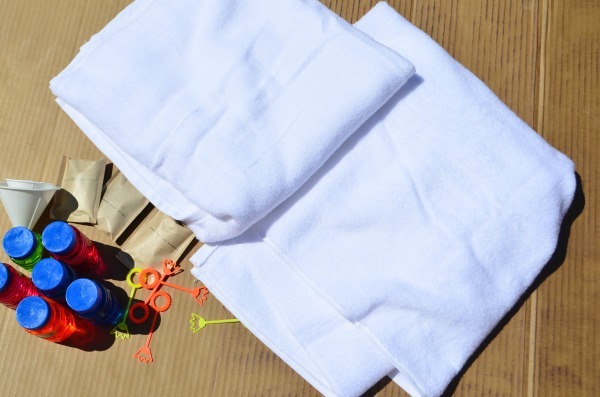 Allow your towel to sit out overnight, or at least 8 hours. Then place in the wash, rinse with hot water. Wash with detergent, then dry. Make sure to run your wash on a rinse only cycle to make sure all the dye has rinsed out. 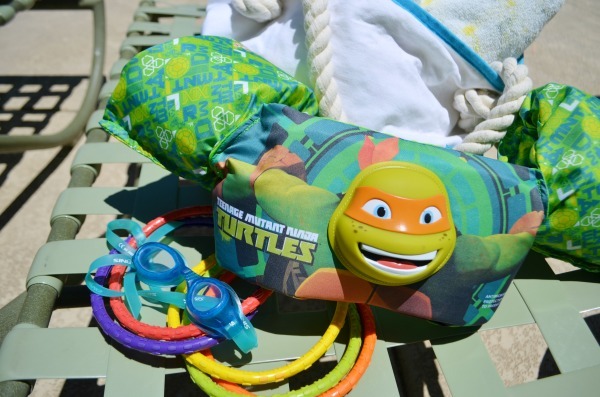 For a summer ready bag pack up your splatter paint beach towels, Stearns® Puddle Jumper® life jacket, and a bag of pool essentials. For swimming: goggles keep little eyes protected from the chlorine, dive rings for practicing putting your head under water, plus extra sunscreen for lathering up later in the day. 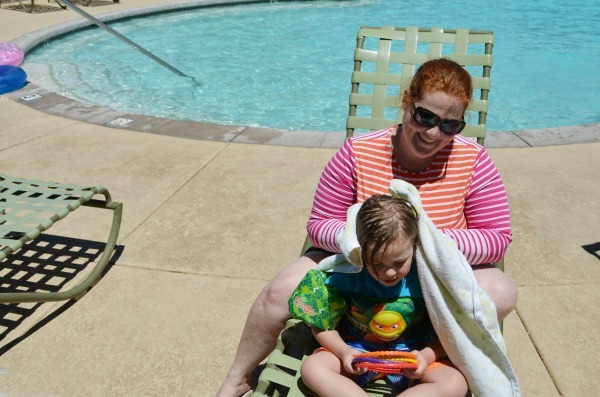 In a waterproof bag goes everything for after the pool: swimmer’s ear to help little ears dry out, shampoo to get the chlorine out, detangler, and a brush. 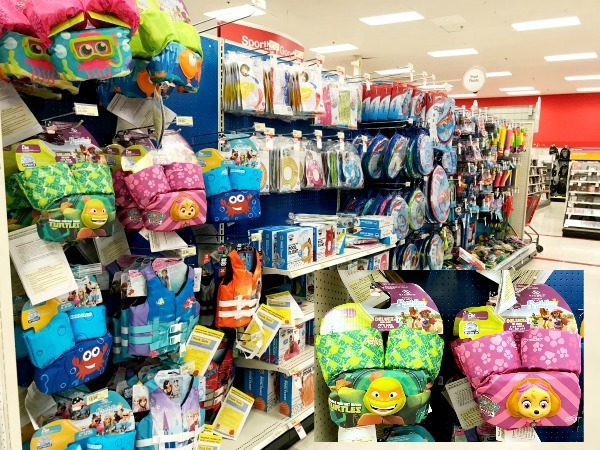 We picked up our new Stearns® Puddle Jumper® 3D Life Jacket at Target while we were shopping for other summer essentials. 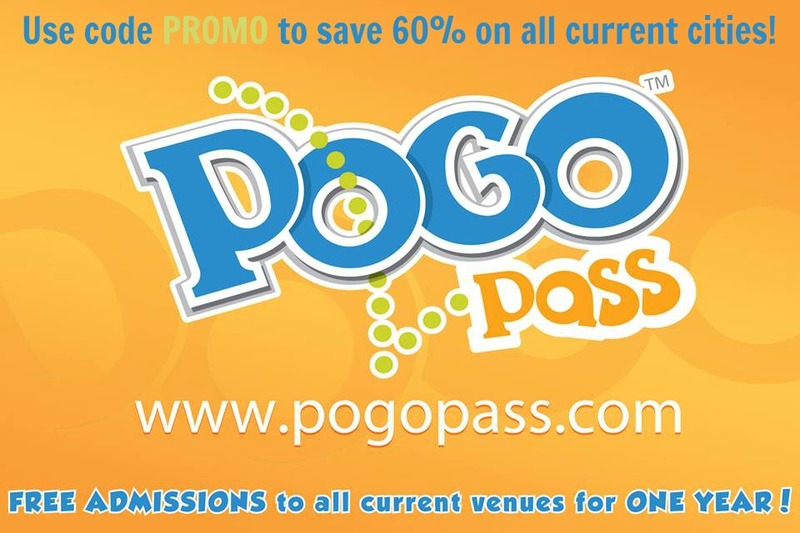 They have a great selection of character designs including Teenage Mutant Ninja Turtles® and PAW Patrol®. 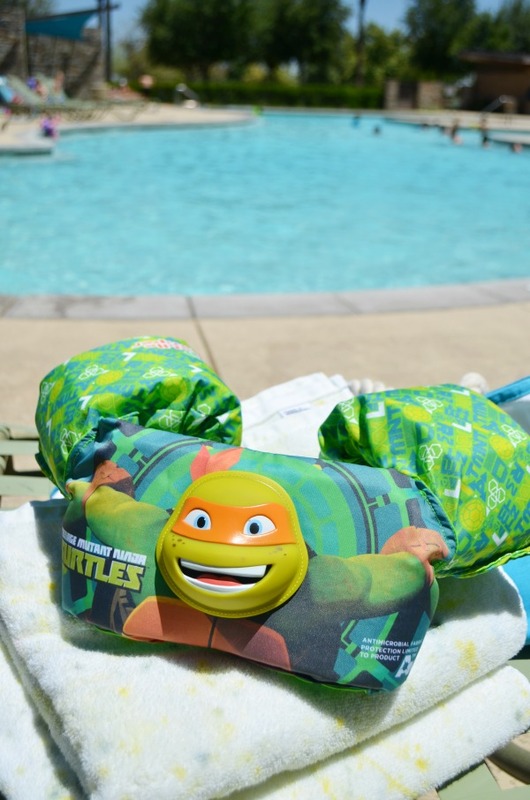 Put Puddle Jumper® onto your summer essentials list, pack a bag and head to the pool for a summer of safe fun by the water. 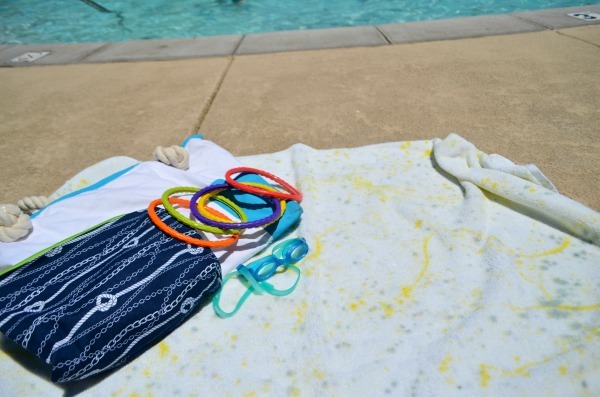 Pin this easy tutorial for creative DIY beach towels and create some fun with the kids this summer!